The official year of the opening of this museum is 1896. The beginning of the natural-history collection was triggered with the collecting activity of a member of Russian Geographic Society and explorer of Central Asia, captain of 17th Turkestan battalion, L.S. Barshchevsky, a Moscow merchant Reshetnikov, and military governor, earl M.Ya. Rostovtsev. Previously, this museum had been known as Samarkand State Museum- Reserve. In 1981, Samarkand regional museum of local history was organized within this museum. The ornithological collection is a component of the zoological collection of the Department of Nature of this museum. The biggest part of the collection consists of collections of a well-known Uzbek ornithologist Aleksandr Nikolaevich Bogdanov, who worked in Samarkand museum since 1930s to mid 1970s, at first as a guide and then as a scientific associate. An excellent taxidermist, A.N. Bogdanov produced many skins and stuffed animals for the museum collection. The second associate of the museum who made a significant contribution to the expansion of the collection was P.F. Rypl - a laboratory assistant at this museum. Other associates also participated in the expansion of the collection: V.E. Zakharov (1934-1941) and V.I. Kotovsky (1937-1938). From 1933 to 1938, brothers S.K. and K.K. Dal made their collections in the vicinity of Samarkand. Currently, the ornithological collections of Samarkand Museum of Local History include 858 specimens. 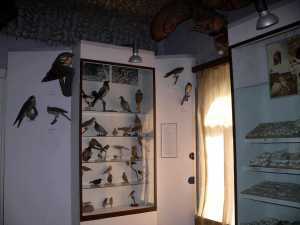 Throughout the history of this museum, part of bird specimens (305 specimens, mainly stuffed birds) was written off as outwear, while part was given to other museums. However, data on these specimens were preserved in museum registers and during the inventory were included into the database. Hence, the electronic database of the ornithological collection contains information on 1163 specimens. There are totally 259 species of 18 orders in the funds and electronic database of the collection of Samarkand Regional Museum of Local History, which constitutes 57.8% of the avifauna in Uzbekistan. Pelecaniformes are represented fully enough with all four species; Ciconiiformes, 83.3% species; Falconiformes, 68,3%; Alliformes, 71.4 %; Gruiformes, 78.6%; Columbiformes, 91,7%; Strigiformes, 87.5%; all species of Coraciiformes and Upupiformes; 2 out of 3 species of Piciformes. Less abundant are Passeriformes, 56.7%; Anseriformes, 52.6%; Podicipediformes, 40.0%; Charadriiformes, 37.5%. From 1923 to 1927 and later from 1938 to 1941, A.N. Bogdanov made collections in the vicinity of Samarkand; in 1947, in the mid-part of the Ridge Nuratau. In 1948-1949, he went along the route Town of Pendjikent - Village Mindona - Village Vishist - Town of Pedjikent - Village Kosh-khona near the River Kshtut - Town of Pendjikent; Village Kshtut - Lake Kul-i-Kalon - Pass Laudan - Village Kshtut - Lake Kushkyr-ata - Zauran-Sai - Village Kshtut. In 1928-1932 and in 1934-1939 P.F. Rypl made collections in the vicinity of Samarkand. From April 1932 to August 1934 he conducted studies in the vicinity of Lake Iskander-Kul on the order of Samarkand State Museum. Therefore, the most abundant and diverse collections are those made in the mid- and lower courses of the River Zarafshan (56.57% of all collection specimens) comprising 188 species of 15 orders and from the Pamirs-Alai (31.7% of all specimens). The collections of 27 species of 9 orders from the Desert Kyzylkum constitute only 3.1% of all collections. From the remaining five regions (the Amudarya, the Kashkadarya, Tashkent province plain lands, western Tien Shan and the Ferghana Valley) only sole specimens are available. Geographically unidentified were 7.3% of the all specimens. The main stocking of the collection took place from 1931 to 1940s mainly with the collected materials of A.N. Bogdanov and P.F. Rypl. In the period of ten years, 841 specimens of birds (72.3% of the entire collection) were included into the collection. 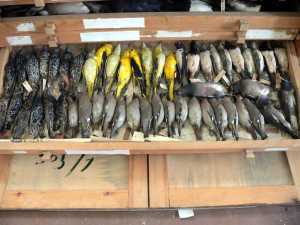 More than half of the ornithological collection is stuffed animals exhibited in glass cases of the museum; the others are kept as skins in wooden collection cabinets with drawers. All the specimens are provided with detailed labels.